Project: Dead End part 6 – Print and Play! The time has finally arrived for me to share this game with you. After my last post, the game has gone through a few revisions. I meant to post something after the first revision, but I really didn’t want to keep writing more and more about the various little changes I was making. The difference between version 3 and version 3.2 were very slight with almost no play changes taking place, and only a few minor wording changes on cards. The game was still very fun, but needed to be even leaner and more tense. So, I skipped posting about 3.2 and here we have arrived at 4.0! This being officially the fourth iteration of the game, there have been some small changes that add up to be dramatic game play differences. For one, I cut Noisy Neighbor altogether. I heard too many times that players didn’t like the card but felt that there needed to be a tense moment when they fire a gun… because that’s what happens in the movies. Everyone knows that loud noises attract zombies. So, one of the playtesters offered up a simple solution: put the drawback on the guns themselves. Brilliant! That simple change offered up a few more streamlining options and let me work on the Event cards a bit. Beyond the way guns work, and some numbers changing, the game has remained fairly stable from version three until now. I’m very satisfied with the underlying system, now it’s just a matter of tuning everything up and playing with new cards and abilities. FAIL: Gain 1 zombie and discard Pistol. 4 No 2 Axe Lose one Zombie. 1-3 SUCCESS: Lose 1 zombie for each success. 4 SUCCESS: Lose all zombies. SUCCESS: Move 2 zombies from your house to any opponent(s). 2 No 2 Steady Aim All shots fired this turn automatically succeed. Do not flip any cards. Each opponent gains 2 zombies. Each opponent loses 1 zombie. 6 Yes 1 Strong Zombie When you play Strong Zombie FLIP: 1. SUCCESS: Discard one Barricade on the target opponent’s house. 2 Yes 1 Wandering Zombie At the end of your turn, move Wandering Zombie to any opponent. 2 Yes 1 Tough Zombie When you play Tough Zombie you may discard one GUN from the target opponent’s house. Removal has gotten a bit more potent, so the zombies were adjusted slightly to compensate. I want the players to be forced to deal with zombies and as the game currently sits, it’s entirely possible that players turtle up and never play zombies on each other prolonging the game for a very long time. Maybe even indefinitely. So, the zombie cards have got nastier and nastier. The players are constantly facing the impending doom of a zombie apocalypse. 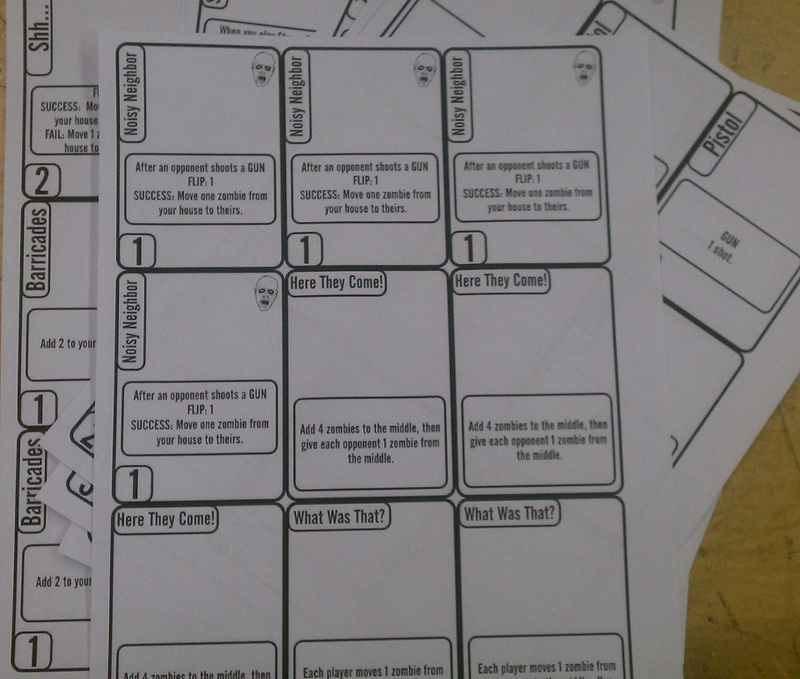 Now, as I promised, I’m including a playtest version of the game with this post. Obviously this is Print and Play, so anyone that wants to give it a shot is welcome to try it out. All you’ll need is a few sheets of paper or card stock to print the cards on, counters to represent zombies, and a few distinguishable counters to represent Wandering Zombies. All I ask for anyone that is interested in playtesting is please tell me how it goes! I’m not great at writing rules. I always feel like I am either over explaining or not explaining enough. I feel it is the weakest part of my designs. Even though Scallywags did not change much from the initial playtest, the rules went through near ten revisions before I was happy. Keep that in mind when reading this set! This is the very first draft and will likely need a significant number of changes before they can teach the game properly. If you have questions before, during, or after a test, the fastest way to reach me is email or Twitter. If that doesn’t work for you, feel free to post a question to the BoardGameGeek link or my Google + post. Currently we are just testing the balance of the cards. I don’t have any major revisions in mind. I would like to test the game with more than 5 and it may be necessary to modify the base defense of the house based on the number of players. I would like for the last living player to have a chance at survival and if there are 3 to 6 players ganging up, that seems unlikely. I would also like to hear any ideas that you may have for new cards or different effects. I want to keep the game fairly light, but I’m always open to suggestions. 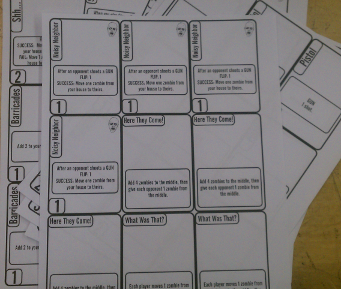 I’m finally getting around to redesigning the game pages. 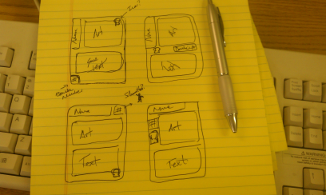 I had to do a bit of a re-write on every page to make it all work well without over complicating things. I hope I didn’t break anything. Please goof around and let me know if you find anything that needs fixed! I was reading @FatherGeek‘s review of Martian Dice just a few days after finding his review of Zombie Dice. Both of those games sounded interesting to me and I quickly added them to my BoardGameGeek wishlist. Now, I have never played these types of games. I, of course, played Yahtzee when I was younger, but since developing a fascination for designer games, I’ve not given dice games like these a thought. What really intrigued me about Father Geek’s reviews was how much his sons enjoyed these games. I’ve got two little ones myself and they enjoy tactile experiences as well. The difference is that my little ones are both girls. Would they enjoy dice games about zombies and alien abductions? I’m thinking Princess-Fairy-Rainbow-Unicorn Dice instead!? I was only semi-serious with that last tweet, but having never played these games, I really didn’t know how to approach the style in a new manner. That is a minor technicality to my brain apparently because during the drive home I could not get the idea out of my head. In the 45 minute commute I had developed the underlying game and by the time I got home I even figured out how to fit the theme. So here’s the story: In Magic Fairy Princess Landtm the princesses have entered into a competition to see who can gather the most stuff. On their adventures, they are trying to gather items, but the Evil Witch is stealing things all over the land. The players race to gather their things before the witch can steal them all and in the end, the princess with the most stuff wins! Now I’m just a dad, so what do I know of pretty princesses and unicorns? That’s where my girls come in. We had the house to ourselves because mommy had a girls night out, so we set to making the game pretty. I asked them what sorts of things princesses wanted to have and after much deliberation they decided on crowns, dresses, fairies, and unicorns. I would have picked different things, but I’m just dad, I’m not in tune with the princess community. They spent about an hour helping me pick out some source artwork and colors so we could make pretty dice. As you can see, I’m not a great artist. The title of the site is not a lie! My girls were satisfied with the designs after a few tweaks and we quickly had a working prototype. Now, black and white images may work just fine for us moms and dads who play our euro-games, but for two little girls who want to play with pretty things, we could not stop there. We had to make pretty dice! This is where having access to a good printer and prototyping parts comes in handy. Sadly, I have neither of those things, but luckily I know Andrew Tullsen of Print and Play Productions. He specializes in this sort of thing, so I built up some pretty dice faces and got the order to him as quickly as I could. We’d need pink, purple, and blue dice, some stickers, and I ordered some cubes to keep score. Now, as you can see, we’ve got five symbols to sort out on three different color dice. We will have two each of the three dice for a total of six dice in play. One dice will have two unicorns, one will have two fairies, and the third will have two dresses. These are the things that princesses want the most according to my daughters. We will also need a score sheet which I haven’t designed yet. That sheet will need to have a score track from 1 to TBD and three tracks, one for each item, from 1 to 10 or 15 or so. These numbers aren’t hard set yet and will be worked on through further playtesting. Here’s how we currently play: the active player rolls all six dice. Any witches that are rolled are immediately set aside. 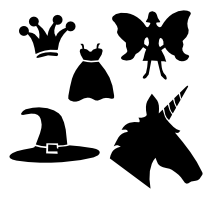 For each witch rolled, the player must set aside all of 1 type of dice (fairy, dress, unicorn). 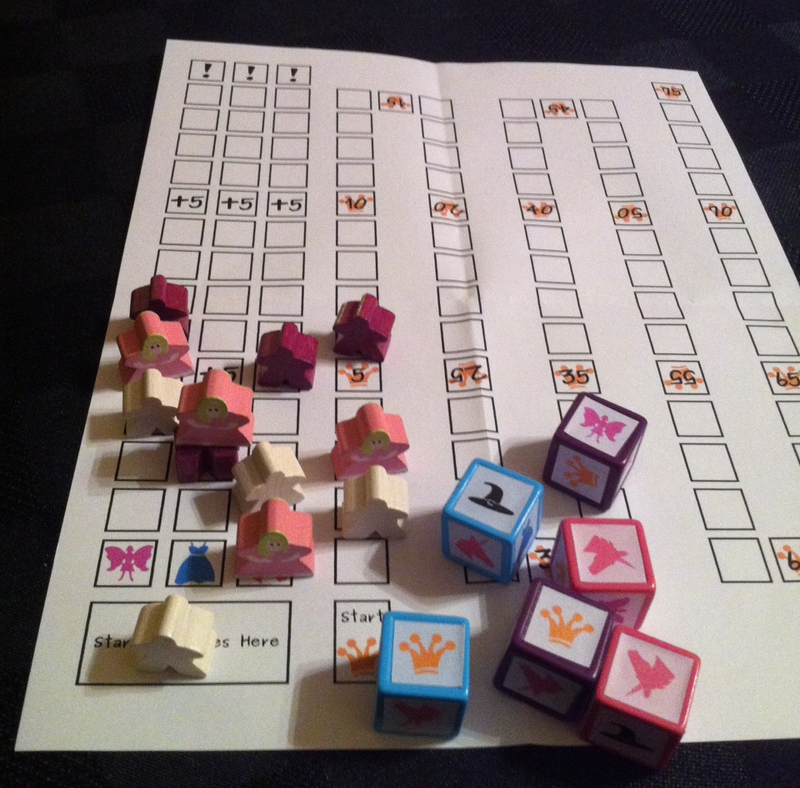 The player may then set aside any dice that they want to score and re-roll any number of the remaining dice. Any dice rolled which match a type that the witch is currently holding are immediately removed. Also, any new witches rolled must be removed along with another type of dice. If a player rolls three witches their turn ends and only crowns are scored. The player may keep re-rolling as long as they have dice available, but witches and the dice they stole, and any dice removed by the player for scoring may not be re-rolled. After the player is satisfied with the results, score is taken. Each crown rolled is worth 1 point and the players token is advanced on the scoring track. For each fairy, dress, and unicorn remaining the players token is moved forward one space on the respective track. In the end, the player with the most of each type gets a bonus. Example time! I roll the 6 dice. 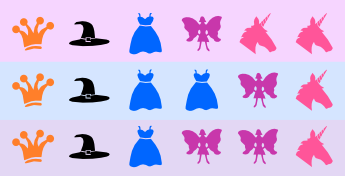 I roll 1 witch, 2 fairies, 1 dress, and 2 crowns. I must set aside the witch and one type of dice. I choose the dress because I’m already leading in that category. I’m really looking for unicorns, so I re-roll all the remaining dice. On my second roll, I get 2 dresses, 1 unicorn and 1 crown. I must now set aside both dresses because the witch has stolen them! I have 2 dice remaining and decide to end my turn gaining 1 point and 1 unicorn. It is now the next players turn. Scoring is not yet settled. There are essentially three scoring mechanisms and balancing them will be something that is done through further playtesting. Currently the game continues until someone gathers 15 of one type of item. At that point, the player with the most of each item scores an additional 10 points. Also, each player scores 5 points for each item that they gathered at least 5 of and an additional 5 points for gathering 10. There is also a possibility that I will make crowns worth 2 points each, but we’ll see. I encourage others to test out variations of the scoring system and we can collectively come up with something! 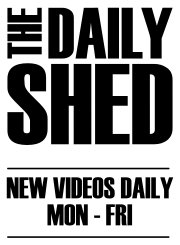 If you’ve been following along, I teased in my last post that I was excited about the new direction of the game. My first playtest was successful, but it was obvious that I needed to spend some serious time tuning things and and livening it up a bit. I went back, tweaked a bit here and there and what came out as version 2 was garbage. The game broke. It was no fun, not engaging at all and could very easily go on forever unless the players made a conscious decision to not survive. What was worse, adding up all the players scores every turn was really annoying. I had successfully stripped all the fun out of the design. So, I let things sit for a while and didn’t think about it. Every now and again I had a little idea, but nothing great. On my way home from work one day, it really hit me: take the zombies off of the cards. 6 No 1 Pistol GUN. 1 Shot. 4 No 2 Shotgun GUN. 3 Shots. 4 No 3 Axe Kill one Zombie. 3 No 3 Molotov Cocktail FLIP: 5. 1-4 SUCCESS: Kill 1 zombie for each success. 5 SUCCESS: Kill all zombies. You die. 4 No 2 Shh… FLIP: 1. SUCCESS: Move 2 zombies from your house to the middle. FAIL: Move 1 zombie from your house to the middle. 6 No 2 Barricade Add 2 to your house’s defense. 4 Yes 1 Noisy Neighbor After an opponent shoots a GUN, FLIP: 1. SUCCESS: you may move one zombie from your house tho their’s. 3 No None Here they come! Give each opponent 1 zombie from the middle. 2 No None What Was That? Each player moves 1 zombie from their house to the middle. You may move 1 additional zombie. 6 Yes 1 Strong Zombie When you play Strong Zombie FLIP: 1. SUCCESS: Destroy one barricade on the target player’s house. 2 Yes 1 Wandering Zombie At the end of your turn, move Wandering Zombie to a player on your left or right. Alright, first thing is first, new mechanics. One thing that bothered me about the initial design was Barricades and Noisy Neighbor. Barricades were practically useless because it only took one Strong Zombie to knock them down. If you were over-crowded with zombies already, this could be a killing blow. I want barricades, and I want zombies to break them down… I think it is very thematic… but I didn’t want to nullify the usefulness of the Barricades, or else they may just get played as zombies all the time. Also, with Noisy Neighbor, Pistol was an almost useless card. You could kill a zombie, sure, but a small one and chances are, if someone is holding the Noisy Neighbor, you get a 5 or 7 strength zombie in return. Now that all zombies are of equal strength, it is not such a broken card, but I still felt like it was too consistent. My fix for all of this (and more) was to add a randomizer. I had always intended to have a zombie icon on the cards that can be played by dead players, so I decided that this would be the perfect randomizer. When playing a card that has a random element, you flip the top card of the deck. If there is a zombie icon on the card, you fail. This means Strong Zombie is not a guarantee and neither is getting to move off a zombie with Noisy Neighbor. So, when you see FLIP:# on a card, that means that you flip that many from the top of the deck and then consult the card for what happens on a success or failure. I also added the idea that guns stay in play in front of you and are loaded with a certain number of shots. Now, when playing a Pistol or Shotgun, you keep it face up in front of you and add the appropriate number of counters equal to the number of shots the gun has. When you fire the gun, you remove one of these counters and flip the top card of the deck. On a success, you kill 1 zombie. I did not decide at this point how the multiple shots on Shotgun would work, so I decided that we’d figure that out in playtesting. When the gun has no shots remaining, it is discarded. Event cards are a bit of a change from the previous version. There are now 2, Here They Come and What Was That. Both of these cards are played immediately when drawn and the player draws an additional card for their hand. These cards are never taken into hand so they cannot be played as a zombie card. The last big change is the strength of the player’s houses and the zombie value on the cards. With the previous version set at a defense of 25, there was way too much counting and adding in the game. Now that all zombies are 1 strength, I decided that a good number for the defense was 10. I adjusted the zombie values accordingly. Also, now that we are dealing with a pool of zombies, it is no longer required that you assign all of the zombies to a single player when playing a zombie card of strength 2 or higher. These values are no longer strength, but are number instead. If you play a zombie card with 2 or 3 on it, you can assign that many zombies from the middle to any number of players. I found that this greatly eased tensions between players because more often than not we would split up the zombies to keep things even. After I laid out all the cards I wanted to make, I started thinking about how many of each card I wanted in the deck (again) as well as how I wanted to distribute the zombie icons. 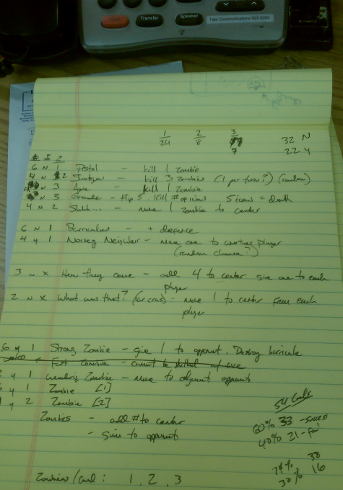 I had a bit of a slow day at work and as you can see I spent some time doing math figuring all this out. In the end, I decided to weight the deck in favor of successes when flipping. I came out with a roughly 60-40 split which would drop closer to 50-50 as players keep guns and Barricades in front of them and the deck reshuffles. Now, this is where my previous efforts to make neat and orderly playtest cards fails. I have completely changed the way cards work. So the design is all wrong. I need to adjust the old card template to put the new information where I need it. 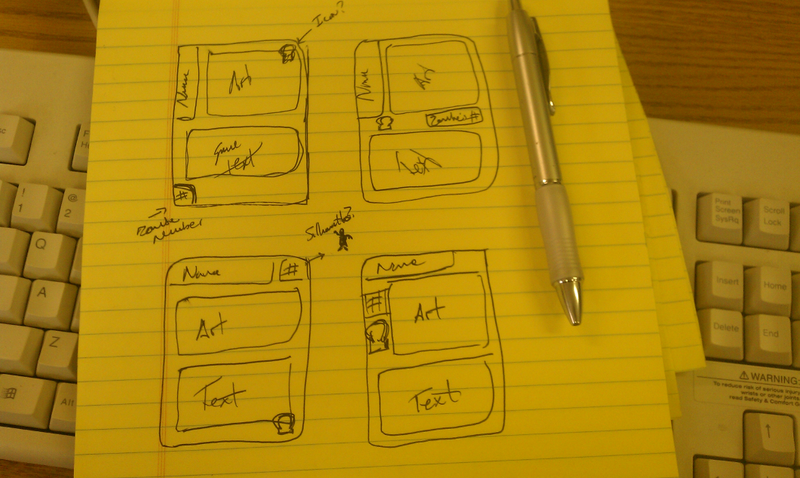 Had I just stuck with hand-written cards like a normal person, I wouldn’t have had to spend more time at work figuring out how to do the layout. In the end, I didn’t even really change much. I re-hashed the old template to save some time. It’ll get fixed some day after the design stabilizes more, but there’s lots more playtesting to go. I’m going to end this post here. I have playtested this version of the game and I can assure you, it is MUCH better than v2. There is still loads of room for improvement, but I need to be sure that the base system is stable before adding more on top of it. I will detail my playtest session with the next post and if I can be troubled to write out a concise set of rules, I may upload a printable version of v3.2 for you to try out! It’s my goal to make this game Print and Play throughout the design process so everyone can keep it going… interaction is my motivator, so please please please let me know what you think so far.